Pierce Brosnan is now the spokesman for Lee National Denim Day, which supports the early diagnosis and treatment research of cancer, particulary breast cancer and other women's cancer. On October 6th wear your favorite pair of jeans and donate $5 to the cause. Support the Woman's Cancer Program of EIF (Entertainment Industry Foundation) fight the good fight. Since the 6th is a Friday wearing jeans to work will be more acceptable in most work environments. As we launch the second decade of Lee National Denim Day, we are excited to announce a new partnership with the Women's Cancer Programs of EIF. Lee National Denim Day will benefit local breast cancer prevention services, as well as groundbreaking early detection and treatment research at leading cancer centers nationwide. For more information about this exciting new partnership, click here. As honorary chair of the Entertainment Industry Foundation (EIF), Pierce Brosnan, international movie star, producer, artist and activist, has added another title to his list ambassador for Lee National Denim Day. In this powerful new role, Brosnan will help bring more awareness to the fight against breast cancer and encourage people nationwide to participate in Denim Day. In a new public service campaign that kicks off the second decade of Lee National Denim Day, Brosnan urges men and women across the country to don denim on October 6, while pledging a $5 donation to support innovative breast cancer research. The fundraising program has raised more than $61 million to support breast cancer programs, and this next decade brings a chance to do even more. "I'm proud to join Lee Jeans and the Entertainment Industry Foundation in this tremendously important battle to eliminate breast cancer from all our lives," said Brosnan. "Lee National Denim Day is an easy way for friends and colleagues to unite in support of a groundbreaking scientific project to detect breast cancer in its earliest stage." Proceeds from Lee National Denim Day will benefit the Women's Cancer Programs of EIF. Funds will be used to help accelerate treatment research and increase patient access to some of the most significant clinical trials in the nation, as well as continue to support grassroots programs across the country. "Lee National Denim Day participants should be incredibly proud of what we have accomplished together the last ten years," said Liz Cahill, director of advertising and public relations for Lee Jeans. "We couldn't be more excited to launch the second decade of Denim Day with our new charitable partner EIF, with a commitment to fund some of the most important early detection and treatment research that exists, and with Mr. Brosnan’s help, we know people nationwide will be inspired to act." Brosnan, who has lost dear friends to breast cancer, has been a longtime supporter of the cause and currently serves as Honorary Chairman of EIF. 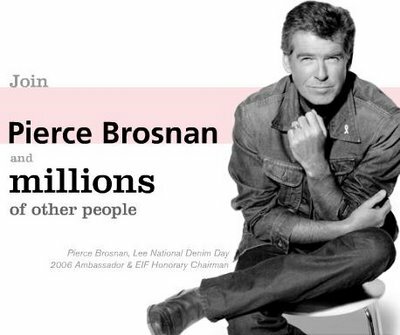 As the 2006 Lee National Denim Day ambassador, Brosnan will appear in a national public service campaign and program materials with the hope of raising awareness about breast cancer and the exciting new developments that can have an impact on the millions affected by the disease each year. Last year, more than 29,000 companies across the nation participated in the single day fundraiser. More than $8.6 million was raised for the fight against breast cancer. Lee Jeans is a division of VF Corporation. VF Corporation is a leader in branded apparel including jeanswear, outdoor products, intimate apparel, image apparel and sportswear. The Entertainment Industry Foundation (EIF), as a leading charitable organization of the entertainment industry, has distributed hundreds of millions of dollars to support charitable initiatives addressing critical health, education and social issues. EIF is committed to saving lives by raising awareness about the importance of early detection of breast and reproductive cancers, and providing funds to advance early detection and treatment research, as well as support to community programs that assist the millions of women and their families at risk of or affected by cancer. Through EIF's National Women’s Cancer Research Alliance and EIF's Revlon Run/Walk For Women, EIF funds some of the most promising research being conducted today to develop new and more effective approaches to the treatment of women’s cancers. EIF grants have helped accelerate research that has contributed to the development of a breakthrough gene treatment called Herceptin, the first successful drug that seeks out a particular gene found in one of three cases of the most aggressive form of breast cancer. EIF grants have also supported other state-of-the-art therapies bringing new and innovative treatment approaches to breast cancer worldwide. More recently, EIF launched its Women’s Cancer Research Fund. Focused on early detection of cancer, the initiative is supporting EIF's Breast Cancer Biomarker Discovery Project – an ambitious, groundbreaking scientific project where a group of internationally recognized scientists and clinicians from some of the best scientific institutions in the world are collaborating to develop a blood test that will detect breast cancer in its beginning stages, when survival rates are highest. Lee National Denim Day is the largest single-day fundraiser for breast cancer. In October, Lee Jeans encourages millions of people nationwide to slip into their favorite jeans and make a $5 donation to support the fight against breast cancer.